I’m from Detroit and moved to Lausanne in December 2012 for my job, which is in public relations. In my free time, I love to cook, travel, explore new cities, walk, read, and spend time with friends. I’m half British, half Swiss, born in U.K. but raised in Lausanne. For work, I’m a Social Media Consultant. 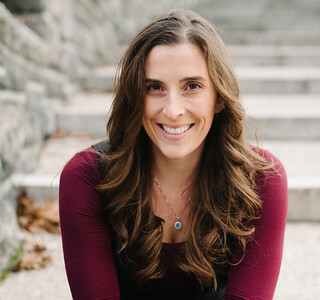 I started in 2006 as a blog consultant and now I help clients understand what online communities and social media are about and how to do intelligent things around that. As for my free time, I love sailing, skiing, walking around in the mountains—all kinds of outdoor sports type stuff. I also play Ingress and I like taking care of my plants and cats, cooking, reading, watching movies, and talking with people over a cup of tea. And then there are my online activities. It’s not always clear if it’s work or free time, but I love blogging and online communities. KATHERINE: Lausanne is seasonal. Winter means ski trips, and summer means leisure time at the lake. 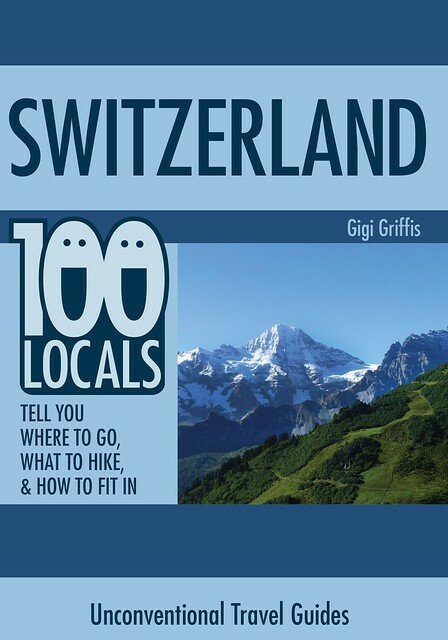 I recommend exploring the winding, multi-leveled streets of the old town, strolling up to the cathedral, experiencing the farmers market on Wednesdays and Saturdays (in old town from 8 a.m. to 1 p.m.), going on hikes through the Lavaux vineyards, visiting the Olympic Museum, taking a boat ride across Lac Léman to France, having a glass of local wine at the lake, and, last but not least, eating fondue! 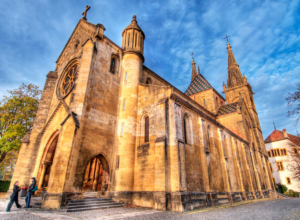 STEPHANIE: The cathedral, the lakeside, and La Citée (old town) are definite must-sees. I also take people up the hill to the top of the town at Sauvabelin. There’s a viewpoint there (Signal de Sauvabelin) where you can see the lake and in the forest there’s a wooden tower that gives a 360-degree view of the area. There are also lots of museums here, including Musée de l’Elysée (the world-renowned Olympic museum), the Natural History Museum in the city center, Palais de Rumine (a palace housing several museums), and Musée de l’Hermitage (for art-lovers). KATHERINE: The Art Brut Museum is quite a find—a world-class collection unlike anything most people have ever seen. STEPHANIE: Walk. Lausanne isn’t very big, so you can walk from the lake to Sauvabelin in just over an hour and you’ll have been across the whole town. One of the nice things about Lausanne is it’s a 3D city, built on three hills. The roads and houses are on various levels. You have staircases and lifts that take you from one level to another and that’s fun to explore. There’s one particular lift that takes you up from Vigie to Chauderon. There are staircases between Le Flon and Bel-Air and at both ends of Font Bessieres. There’s also a staircase quite hidden between Rue Centrale and Rue de la Mercerie that you can go searching for (it’s the kind of thing you wouldn’t find unless you knew it was there). There are nice parks for exploring, too. They are tiny and, again, some of them are tucked away between buildings. There’s one big one near where I live called Parc de Valency and it’s nice because you have a view of the lake. A truly tiny park is hidden in between Avenue de France and Avenue de Echallens near the Aubepines bus stop. Look for a little passageway through the row of buildings. This will take you to the park. Another nearby park is Mont-Goulin. From the bus stop, you’ll see a huge opening in the apartment block that towers above you. When you walk through the passage, the u-shaped gardens inside the apartment blocks have a bench or two and there’s a really nice view of the lake. Finally, make sure to visit the open-air market at Place de la Riponne on Wednesday and Saturday mornings in the city center. It’s quite the experience. 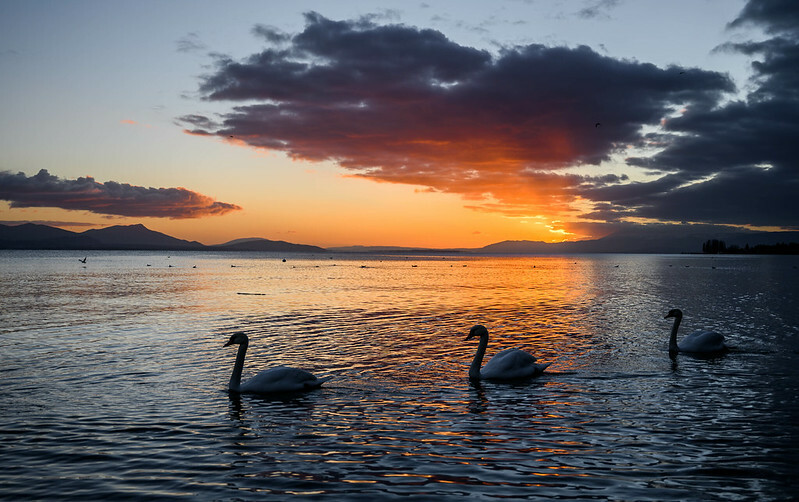 KATHERINE: Stay in Ouchy for a view of the lake and mountains and easy access to all of Lausanne and the neighboring towns. And the city center offers some good options, too. STEPHANIE: By bus, anywhere is just 20 minutes away, so where you stay doesn’t make a big difference to your options when it comes to visiting the town. La Citée is really lovely and the central pedestrian area in the middle of the city is also nice, as are the streets below the train station, popularly called Sous-Gare. 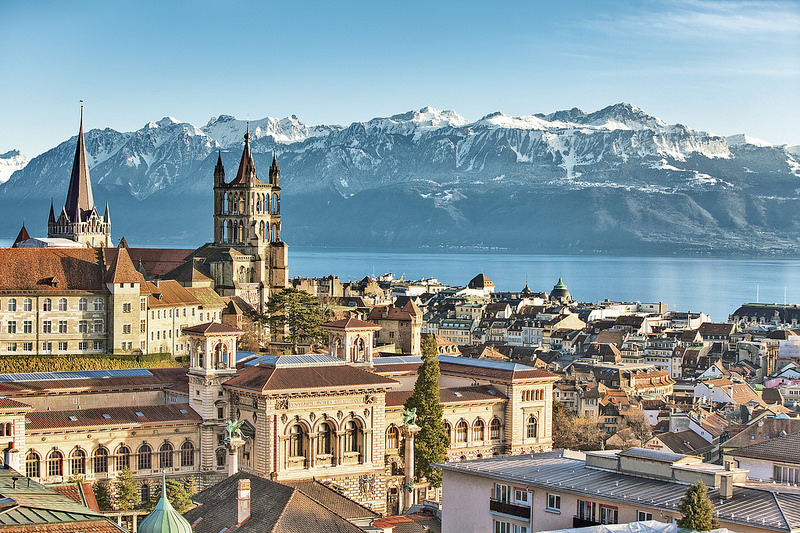 KATHERINE: Must-sees include Montreux, Gruyères, and the Lavaux region. STEPHANIE: One of my top must-sees is a village called Saint-Prex just past Morges, 15 – 20 minutes away by train. It’s a medieval village by the lake with an old center. Another nice little town (on the other side of Lausanne) is Vevey. If you want something further out but fine for a day trip, choose Gruyères. You have the lake, the castle, the Giger Museum, and overpriced (but good) fondue. It’s touristy but very typical and nice. Another option is to head into the countryside around Lausanne. Take the LEB train to Échallens or one of the buses to the more rural areas. In just 15 – 20 minutes, you’re really in the countryside. You can also take the boat (a 40-minute ride) across to Evian or Thonon in France. Evian is the more touristy and Thonon is nicer, in my opinion. Walk around. Have a nice French lunch experience and then come back with the last boat in the evening. And since Switzerland is so small, you could easily take a day trip to Geneva, as well. KATHERINE: Hike through the beautiful vineyards (all terraced down to the lake) of the Lavaux region. The scenery is spectacular and there are little towns with their open wine cellars along the way in case you want to pause for a glass of local wine. 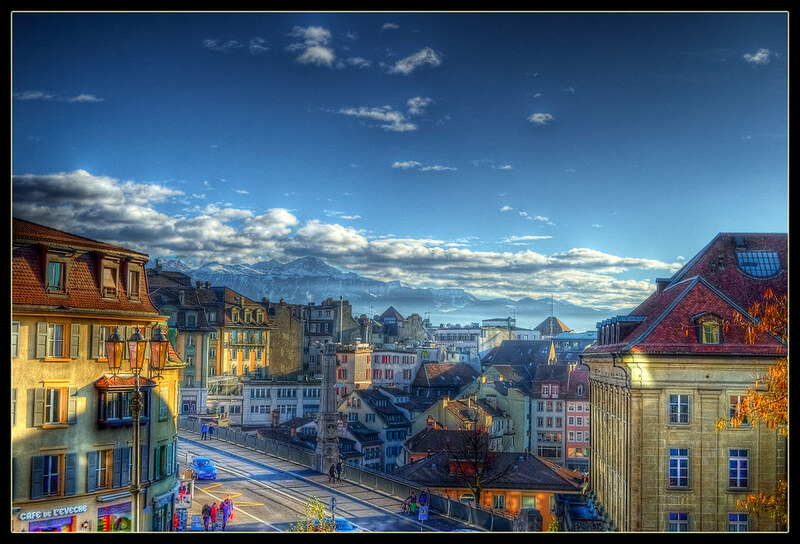 STEPHANIE: By Swiss standards, Lausanne is not near the mountains. But the countryside and the forests are great. So if you want to walk, go and hike in the woods north of Lausanne. Start from Le Mont (drive or take bus 22 to the end) and then walk toward Le Bois du Jorat. North of Le Mont, you’ll reach a really nice forest full of walking paths. You can walk all the way to Chalet- à-Gobet. 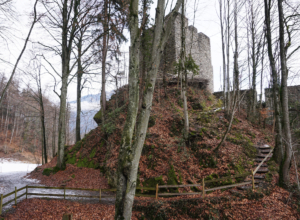 A little closer to Lausanne, the Sauvabelin woods are also nice for a stroll. And there’s also a lot of uphill walking in the city itself. Just walking in Lausanne feels like a lot of hiking. You can also walk all the way to Lutry—an hour or two along the lake. If you want a real mountain hike, you need to go at least as far as Montreux. From Montreux, take the train up to Caux and walk up to Dent de Jaman. Or, stay on the (quite expensive) train, which goes all the way up to Rochers-de-Naye. You can hike all the way up if you’re courageous. Another nice day hike is the Dent de Vaulion. And for other authentic mountain experiences, I recommend the trails above Bex (the area where I have a little chalet). STEPHANIE: The Vaud specialty is the papet vaudois: a particular type of sausage with cabbage in it (saucisse aux choux) and leek and potatoes cooked together. There’s also the malakoff (pieces of cheese battered and fried), boutefas sausage, and tomme cheese. For a savory snack, try the taillé aux greubons (puff pastries made with bacon and apples). In the dessert department, there’s raisinée (thick pear or apple syrup used to make tarts), les beignets des brandons (doughnuts), and meringues topped with thick Gruyère cream (I promise, it’s not cheesy). KATHERINE: Le Chalet Suisse (at Route du Signal 40) offers a very authentic experience. Watergate (Avenue Emile-Henri-Jaques-Dalcroze 9) has a great lakeside vibe. Le Pinte Besson (at Rue de l’Ale 4) has a special old-world charm. And when it comes to bars, choose Le Comptoir (at Rue de la Barre 1) for cocktails, Yatus (at Rue du Petit-Chêne 11) for wine, and Café Bruxelles (at Place de la Riponne 1) for beer. Outside town, check out Le Deck (on Route de la Corniche in Chexbres) for the view. STEPHANIE: Coccinelle Café (at Rue Pichard 18) is nice. They are only open for lunch and are great for afternoon tea and a piece of cake or a nice lunch. La Bossette (at Place du Nord 4) has really lovely local and fusion food, as well as a huge collection of beers. Brasserie du Chateau (at Place du Tunnel 1) is another nice one…I like their pizzas a lot. They also brew their own beer (I don’t drink beer, but they are famous for it). If you go early— 6:30 or 7 p.m.—it’s not too noisy. For something different, try L’Indochine (at Avenue d’Echallens 82) for good Vietnamese food. Also in the international department, I like L’Abyssinia (at Rue du Valentin 14) for Ethiopian food and Le Couscous (at Rue Enning 2) for North African. The secret with Le Couscous is that at the top of the stairs there’s a carpet and it’s traditional to lift up the carpet and take a voucher on your way in. Give the voucher to the waiter and you’ll get two merguez (sausages) as a starter. When you leave, they’ll give the voucher back and you replace it under the carpet. Even locals who are unfamiliar with the restaurant miss out on that one. Finally, in the neighboring town of Morges, don’t miss the Balzac Café (at Rue Louis de Savoie 37; phone: +41 21 811 02 32). They only serve at lunchtime and you should definitely book ahead. But the most important thing to know is that their specialty is hot chocolate. Not the powdered stuff but real hot chocolate from all over the world. There are dozens of options to buy and make at home. STEPHANIE: The cathedral is free. And even the climb to the top costs just a couple francs. So that’s one really cheap thing to do. Oh, and you should buy a sandwich at a kiosk called Metropole at Place Chauderon. It’s doesn’t look very exciting, but they have the best sandwiches in town. Another option for budget food is kebabs. These are our version of fast food, a North African equivalent of the burrito. If you’re in a hurry for lunch, they are affordable and nice. It’s not local food, but it’s a local habit here to eat them at lunch. Finally, in the summer, there are three free swimming pools at Valency, Boisy, and Bellevaux. Swimming pools are normally horrendously expensive, so take advantage of the free ones. 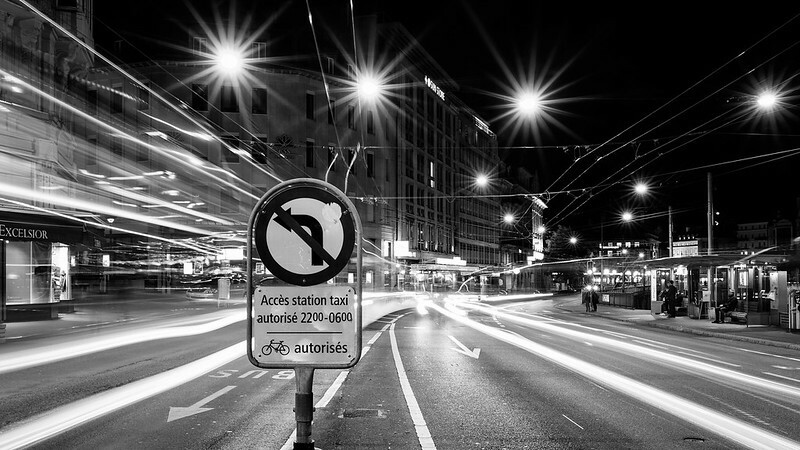 KATHERINE: In Switzerland, it pays to follow the rules. Cross at the crosswalks. Don’t litter. Always say hello and goodbye (in French) when you come into or out of a shop or restaurant. And, whatever you do, drive at the speed limit! There are traffic cameras everywhere. STEPHANIE: The Swiss take their peace and quiet very seriously. Normally, you aren’t supposed to make noise that can be heard outside your apartment between 10 p.m. and 6 a.m. and on Sundays and holidays. If you rent an Airbnb apartment, you need to know that. Another important thing is to look people in the eye when toasting. Not making eye contact during a toast is very rude. We also say hello, goodbye, thank you, and excuse me a lot. And people don’t really like telling you that you’re bothering them, so you have to be on the lookout to make sure you’re not disturbing someone. If you’re in the way, Americans will tell you. Swiss people won’t tell you. They’ll sit there and fume. And maybe glare at your back. So be conscientious. Finally, let people get off before you get on trains/buses. KATHERINE: Like anywhere, if you go out and start chatting with strangers, they typically respond positively. 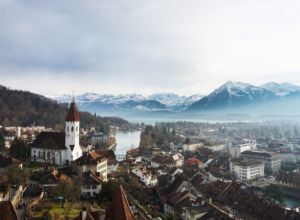 It’s difficult to define what exactly a local is in Lausanne, as the town’s population is over 40% non-Swiss. With so many people from all over the world, it’s easy to make friends and have a casual chat with strangers. STEPHANIE: Join some group activities. There are singing groups, dancing groups, sports groups…especially if you’re studying here. The university has tons of extracurriculars. Also, learn the language if you want to settle here. I’m amazed at the people who arrive and think they can get by in English. People here don’t really speak English. Do a tandem language exchange to improve your French and meet people. There are also inexpensive classes (of various types) at Ecole Club Migros. If you are a pub person, we have plenty. The Captain Cook Pub attracts a big expat crowd, as does The Great Escape. 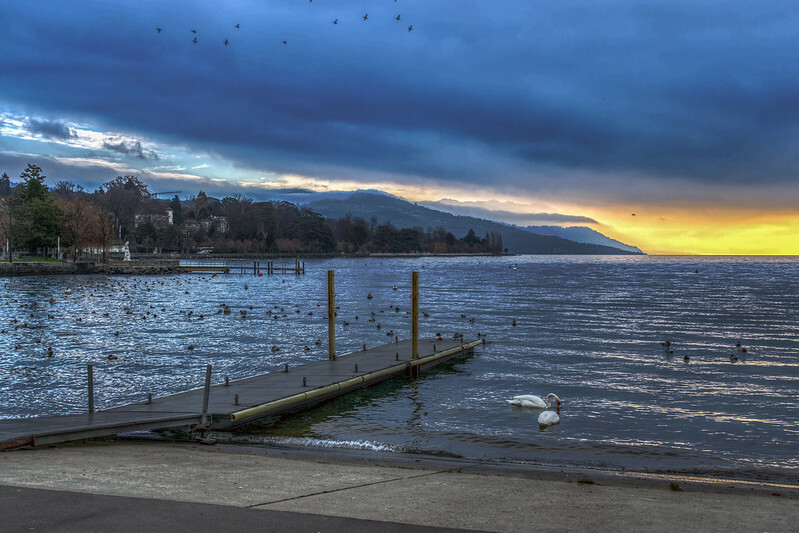 KATHERINE: You can take some great photos from Ouchy, as well as in front of the Lausanne Cathedral and from the Lavaux Vineyards. It’s hard to go wrong, especially if the sun is shining. STEPHANIE: The cathedral and the old market stairs that lead to the cathedral. I’m sure the marketplace on Wednesday and Saturday mornings is great. And by the lake you’ll get a good mountain backdrop on a clear day. If you want a view, go to the Signal de Sauvabelin viewpoint and the tower in the woods above town. You’ll get a great 360-degree view from there. For something quirky, there is a design school in the area that has put together a little group called COFOP (Centre d’Orientation et de Formation Professionnelles). They graffiti the electric boxes in town. Over 100 have been graffitied with people, gorillas, smiley faces—all sorts of weird stuff. 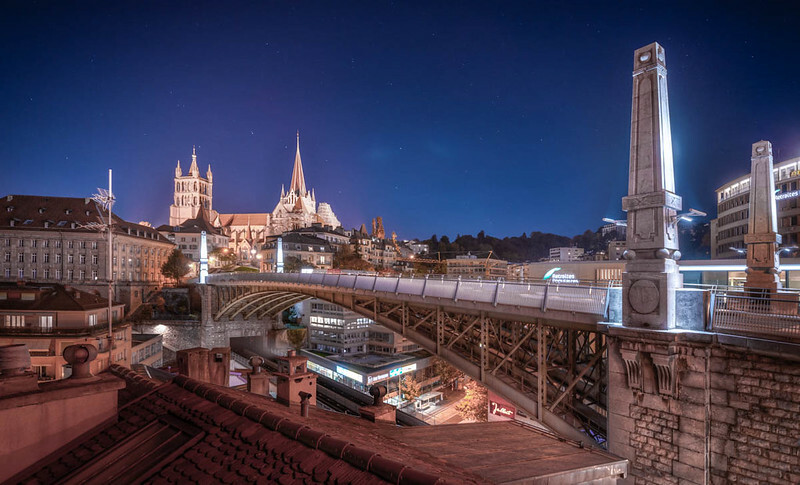 KATHERINE: Lausanne is a city of steep hills, winding streets, secret stairways, and back passages. It’s super charming but easy to get turned around in and wish you were wearing better shoes. An excellent public transportation system (bus and metro) makes it navigable for tourists and locals alike. Find Stephanie at eclau.ch and climbtothestars.org.